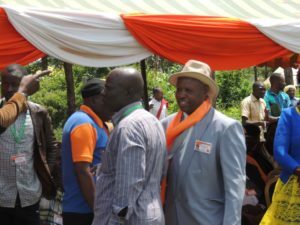 (PHOTO) Drama as ODM leaders barred at Piny Oyie, did ‘Ruto-man’ tag keep Obado away? Why did Migori governor Okoth Obado skip the homecoming party for Women Representative Pamela Odhiambo at Piny Oyie in Suna West sub-county? What was more baffling was that as the function progressed Obado, who was within the county didn’t even bother to send a representative or get an apology sent through. This was despite his director of protocol Moses Ouma and a handful of his supporters being present which created tension in the function. 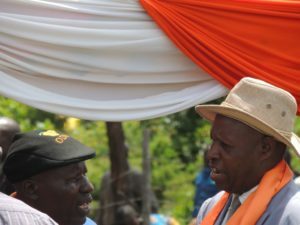 In fact the governor presence, despite his absence at the function was felt as the DJ played his campaign songs all along with even a musician with his hit song performing. Actually the song that invited Raila to speak was Obado’s campaign hit song. 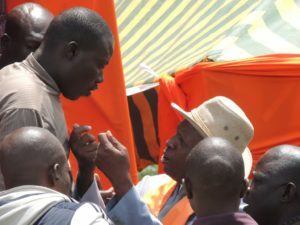 When ODM county ODM leadership led by chairman Philip Makabong’o and Secretary General Joseph Olala (there has been a leadership wrangle here) tried to access VIP tents before the function kicked off tempers flared. As seen from these photos our photographer took, the two were blocked by supporters of the governor with heated words exchanged. 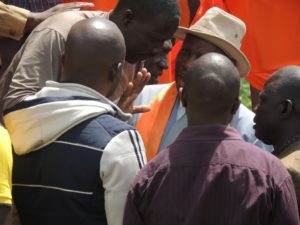 The two, were accused by the angry group of going to ODM leader Raila Odinga and trying to create a rift between him and the governor that he was working closely with Deputy President William Ruto. The same message was thrown at Obado throughout last year campaigns, but didn’t stop him from clinching the ODM ticket and the general election win. In heated exchanged, argument boiled down into protracted MCA nomination list where Makabong’o’s wife and Olala’s daughter and most former cabinet minister Ochilo Ayacko supporters sailed through. The list has been challenged in court, including court of appeal by supporters of Obado. 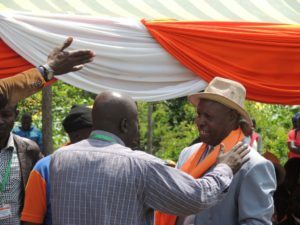 But when Raila spoke, he called on Obado and his main rival Ochilo Ayacko to have a handshake similar to the one he had with President Uhuru Kenyatta to end tension. Raila also called on a court of appeal case challenging the nominated list of MCAs thrown out by those who filed it as they are waging war against the ODM party. His statement brought the warring parties in the county into reflection as Ayacko’s appeal against Obado’s win is headed for a full hearing at Kisumu High Court.